Wishing all of you, my readers, and your loved ones who celebrate the festival of lights, a Happy Hanukkah. The decorations are out inside our home. The lights are ready to go on inside, versus outside. 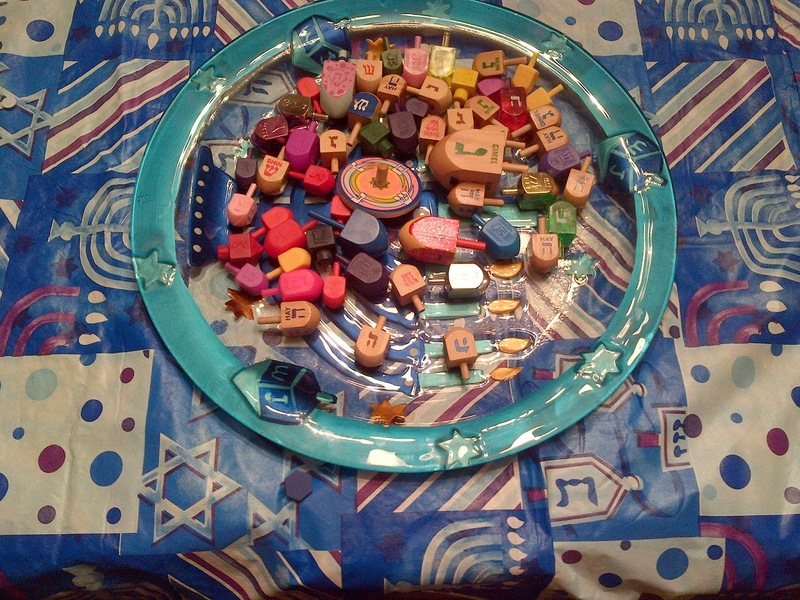 The table is adorned with menorahs both old and new, passed down from loved ones and bought along the way, a plethora of dreidels to spin and play games with, and arts and crafts projects to create and enthuse, as we begin to celebrate. Getting this all set up has become a favorite pastime for Sarah and me each year. She gets so excited when I bring out the bin from the garage with our growing collection of old and new keepsakes. Sarah asked me the other day, “mommy, why don’t we have lights on our house?” She has seen so many on other’s homes covered in white and rainbow colored lights over the years. 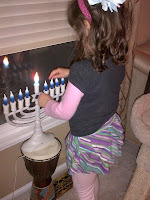 I explained to her that Jewish people don’t put up lights outside their homes but instead conveyed that our most important lights are those of the menorah, which we light together for eight nights inside our home, and can be seen outside by others. Before the age of eight, I don’t remember much about the holidays nor lighting of the candles for Hanukkah. My mom was on her own raising three kids doing all that she could. It wasn’t until our family grew and my mom remarried, that I really became engaged in learning more about my religion, thanks to the teachings by my step-father. 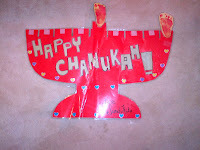 We didn't have much more than the menorah lights as decoration around the house. It wasn't because we were without, it was because there was no need for more. That’s all I knew so I never expected and wanted for anything more. Something about that "really old" menorah, that my parents still use to this day, forever connects me to this holiday. I have such happy memories standing in the kitchen wearing a napkin on my head singing the prayer for the holiday lighting the colorful wax candles. Something about it was so simple, yet spoke volumes. Funny enough, every year, my mom and stepfather would take my sister and me in the car and drive us around what we called “the rich neighborhood" to see the elegant trees, magnificent wreaths and homes emblazoned with lights. It was always a great sight. I appreciated that my folks recognized the splendor of these lights for another’s holiday, even if it wasn't for our own. Together, we appreciated the splendor of it all and always looked forward to doing it each year. Therefore, after having Sarah I felt that I wanted to introduce some of our own traditions to start her on her way to learning more about her religion. I wanted so much for her to love it as much as I do. So, by adding in some decorations I think it has helped with engaging her early on in her life about what these traditions mean. Not only does this approach put us in the mood, but it also lifts our spirits each time we walk into the dining room when we see something that warms our heart or brings a sparkle to our eyes. 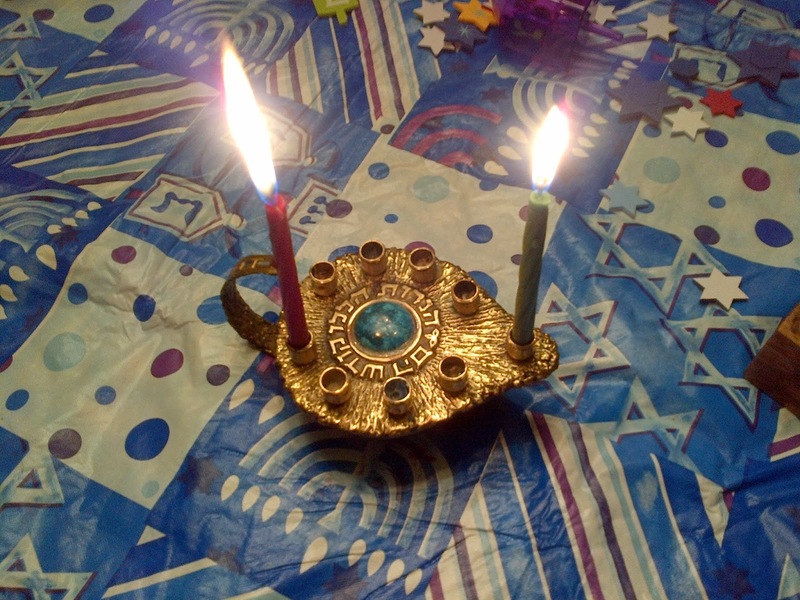 A personal favorite that I treasure most and keep out year round is a yard sale find I found years ago for two dollars – a beautiful unique, teardrop-shaped menorah made in Israel. The owner either didn't know the gem he had or wanted to make sure someone who bought it would appreciate it. Well, the latter is indeed very true. Another favorite for me, and Sarah as well, is this handmade menorah from her first ever Hanukkah, which I made out of paper and used her footprints to resemble the flickering candles. To this day it always brings a smile to my face, and if you can believe this, it helps to ground me and remind me of life’s simple pleasures. As parents, it's our job to help guide our children, especially as far as religious and spiritual beliefs go. Therefore, when Hanukkah comes around for us, especially as my daughter starts to gain a better understanding of this holiday, it seems as if more needs to be done on my part, and her daddy’s, to help her see its value, especially beyond the gifts and glamour. I admit that I often go overboard a bit on presents. However, one thing is true, I never lose sight of doing what I can to help others. And, that selfless act of kindness is what I continue to teach Sarah day in and day out. Therefore, this year, in lieu of one night of presents Sarah agreed to a suggestion I made to take that gift and donate it to PJ Library, so that another child can benefit from the amazing books and CDs they provide children every month for an entire year at no cost to the recipient. I am so proud of Sarah and feel that it’s never too early to teach our children to give back and help others. So, as the lights burn over these eight days and nights, dreidels spin, fried food gets eaten, and time is spent with loved ones, let's be reminded of the efforts made in our history to create the freedom we now experience today. And, let's celebrate with the lights of the candles as they flicker and be reminiscent of what has been done for us, and what we need to do moving forward to help others. away from their families to protect us. Sarah's grandfathers, great grandfathers and great uncles all reported for military duty to protect our country over the course of many decades long before she was ever born. They were dedicated to their country and committed to their job in keeping us safe. Some of these loved ones are no longer with us while others continue to be a special part of her life. 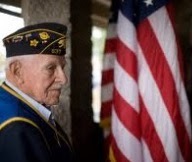 So, today on Veteran's Day, and every other day we say THANK YOU!!! Thank you for your bravery and commitment to helping our country. Let us also take a moment to say Thank You to all the men and women that continue to fight for our country and to protect us, and who sacrifice time away from their families and loved ones to do their jobs. Not only is today Veteran's Day it is also the month of Movember, a movement dedicated to men's health that started back in 2003 in Australia to create awareness around preventable diseases such as prostate cancer. During this month men grow mustaches for the cause to show their support and to encourage open dialogue around men's health topics. Prevention is ever more important especially for veteran's who served time in Vietnam. Their risk for prostate cancer is heightened due to their potential exposure to the herbicide Agent Orange while on military duty. Should a diagnosis of prostate cancer already be given, men are encouraged not to see this as a death sentence, says Oliver Sartor, MD, Tulane University. In a conversation I had with Dr. Sartor during Prostate Cancer Awareness Month in September, he mentioned that there has been an evolution in management of this disease over the past two decades. Along with existing and new treatments, new approaches to disease management including the sequence of treatments is being studied to demonstrate benefits and positive outcomes for patients. What may seem grim is now promising for patients. Like any disease, condition, illness or syndrome, men need the support of their loved ones to help them on the journey to good health especially should a scary diagnosis come about. Even when patients are on the road to recovery with a treatment regimen, the support of friends and family is incredibly important to the individual who is the patient. I recently shared on EmpowHER the role loved ones play in standing behind the men in their lives as they need the support and encouragement to keep going, continue treatment, and fight to live a good life. My husband is in his late 40s and you can bet I worry about his health, especially as he moves closer to the age where risk is elevated especially for prostate cancer. So, maybe I nag him every so often to make sure he gets his flu shot and annual check-ups, and encourage him to seek medical attention if something seems out of the ordinary. My dear friend Don has an uncle with prostate cancer. With family support and a treatment regimen his uncle is managing with the disease well because he is not going at it alone. In his honor his uncle, Don started a team in conjunction with Movember education efforts called Mo Folks. He and my husband, among others, are Mo Bros, growing their mustaches. I am on the team as well as a Mo Sista supporter for the cause. our team? Want to join the cause? Every little bit counts. If you want to make a donation do so by visiting this link below. Together, let's stand behind the men, and especially veterans, we love and encourage them to take their health seriously and also be there to support them when times may be tough and our strength and love is what they need most to help them through one step at a time. When we become parents for the first time, many times some of think we need and want as much as possible to arm and stimulate our children to grow and develop at a rapid pace. How many times did we buy an activity center, musical swing, electronic toy, educational video, and so much more, to find that the money was not well spent because our child was disinterested and did not get the experience out of it we hoped they would? I can say that about a number of purchases I made as a new, first time parent. Let's just say the $200 Baby Can Read! video and book series was burned money. While I know that teaching our children about words and reading is important, isn't it just as good to spend time with them reading the books they like and enjoy without having to plunk down so much change to get them reading in a flash? Again, what's the rush? And, is it really necessary? After too many infomercials and advertisements we become convinced that more needs to done to educate our children, even before they are school age. And, let's admit that when we hear another parent say that their child is already doing something ours may not be, we will do everything possible to try to advance them. Children have been born for centuries and had so much less stimulation and they developed well without all the "stuff" being sold on the market. I am sorry to say it but it's true. I admit, I relied on a number of resources to engage my daughter to stimulate her brain development. Sometimes, many times it was to engage her when I could not. There, I said it. I sometimes relied on toys to entertain my daughter when I could not be her entertainer or educator. When we do spend quality time with our kids it's amazing how much they learn and accomplish when we just converse with them, play with them, and given them pots, pans, and plastic containers to bang on or stack. Nowadays, many of us are working long hours or both parents are working; therefore, leaving even less time to spend with our children. Therefore, time spent with children is less than it was ten to twenty years ago and as a result we tend to rely on these interactive toys to engage our children when they are not in school or when we cannot give them our undivided attention. With so many toys on store shelves it's no wonder we get sucked in to buy them because they are pretty, colorful, fun-looking, and appear to be engaging more than we are able to be. The reality is that time spent with our children teaching them and educating them is what helps them to prosper. So instead of beating ourselves up for not having as much time as we would like to connect with our children, let's make the most of the time we do spend with them and participate in activities that encourage imaginative play, strategic thinking, logic, and so much more. In our house, our favorites includes playing with Barbie dolls, playing board games of all different kinds, reading together, and having dance parties in our family room. As a full time working parent I fully understand that time is not always as much as we would like to have with our kids. Every bit of time is important and makes a difference to our children. We can't expect toys to do the teaching. I think for a while I just figured that that's what these toys were designed to do. While they are many times fun and engaging they can be harmful too. Some of these talking toys sometimes do the thinking for our kids before they have had a chance to think, or get frustrated if a toy asks again for an answer that a child may not have and causes stress when they cannot respond in a quick fashion. As new parents, we are often excited and anxious to arm our children with all the tools necessary for them to grow and thrive, and become advanced. However, the tried and true tools for development including blocks, books, balls, arts and crafts, and socialization skills developed through conversation and natural play are what speak volumes to a child's development. So, when I was offered an opportunity this past month to review a new book about what we can do as parents to help our children develop, with so much less, I was game. This new book titled Retro Baby: Cut Back on All the Gear and Boost Baby's Development with more than 100 Time-Tested Activities, I was intrigued. It didn't hurt that it was supported by the American Academy of Pediatrics. That was a bonus. 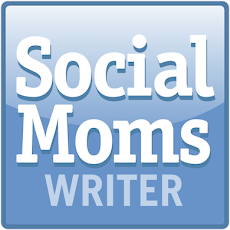 While my daughter is now school aged I felt a responsibility as a parenting blogger and to you my faithful readers who may be new parents, to find out how this could be important and beneficial to know about. 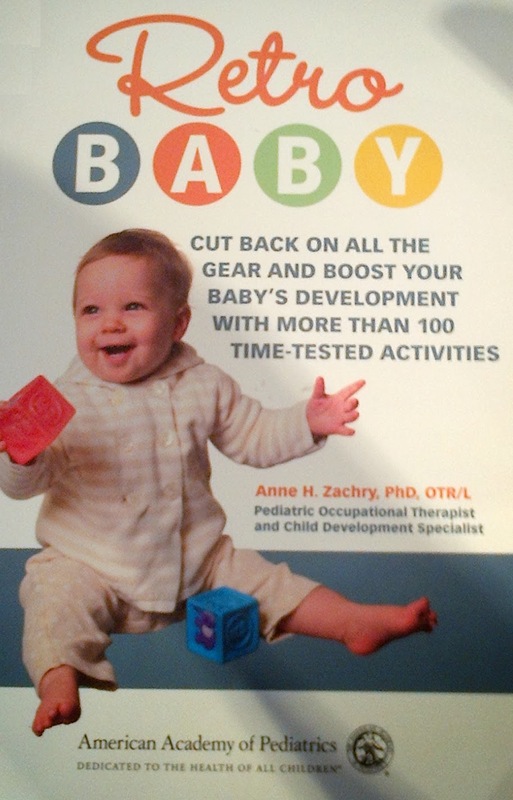 Author, Anne Zachry, PhD, a pediatric occupational therapist, was concerned about the impact of the commercialization of baby development. Her solution with this book is to help parents get back to the basics and not be clouded by the sea of toys and unneeded items touted on store shelves or online that boast lighting up, talking and claiming to make our children smarter. Retro Baby helps to refute the claims and share the facts about child development while empathizing with parents. If you think about it, with toys doing so much of the "work" these days as far as talking, singing, dancing, and more, what happens to our children's ability to create in their minds? I don't ever remember a doll talking let alone peeing after she drank pretend milk. It turns out that according to Dr. Zachry these action toys take time away from the sensory stimulation gained from active movement while held or on the floor. Further, she explores the impact of smart toys and the so called educational television and DVDs that claim our child will be incredibly smart. This mom is guilty as charged. I got sucked in to believing that more could be done than what I was doing with my child. Readers will find that just having a few fundamental toys is so much more impactful than the loud, speaking, singing, dancing and "thinking for you" toys. I remember as a kid what it was like to play with Barbie dolls and imagine for them. Speak for them. Dress them. Engage with them. 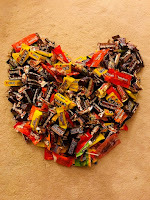 It was an activity I could do for hours. I love now that my daughter enjoys her time with this favorite pastime of mine as she spends much time talking with them, connecting, and developing imaginative conversation and play. Dr. Zachry provides tips and guidance on activities that are safe and stimulating all without overwhelming children. Her book reminded me of all the incredible opportunities for imagination that can be found right in our homes inside our cabinets, the garage and in plain sight. Can we say card board boxes, plastic containers, scarves to dance around with, buckets to fill, food to make instruments with, and so much more. 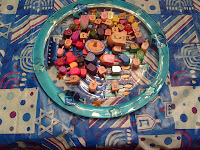 Lest we not forget that there is endless opportunity for counting objects and identifying colors and shapes too. Our children are in sensory overload with so many toys in catalogs, on televisions, online. Dr. Zachry's advice helps to set the record straight and share with parents what is really needed, and what is not. She could have helped me save a lot of money, and opened up a lot of space inside my home, in my daughter's earlier years. While my daughter is well past the age of 24 months I think now about the toys in our home over the years that brought little value to her educational development. I have become more cognizant of the toys that come into my home now and do my best to direct my child to items more likely to stimulate her mind and inspire independent thinking. We think that our children need so much but in essence they need only very little to engage their minds in thinking. Interestingly, with so much around them, they become even more distracted and unable to concentrate, which I am pretty sure is the opposite of what we would want our children to experience. I am so glad that I had the opportunity to review this book as I feel that it has helped to ground me in thoughts for future toy purchases and encourage selection of entertaining tools that will inspire creativity, motivate learning and stimulate ideas and thinking. Because this book brought me so much insight and clarity as a parent, I am now offering the opportunity to one of my lucky readers to be the first to write a comment responding to this blog post on Mommy's Point of View sharing why you want to receive this book, and it will be yours. I will be happy to send it your way and only ask that you pay if forward and share with others to help them on the path to educating our children now and in the future with the motto "less is more."